Are you tired of working for someone else? Do you think starting your own business could get you off the unemployment line? Think again. The failure rate for new businesses within the first 5 years is as high as 90 percent. Before you decide to join the ranks of America’s self-employed, find out if business ownership is right for you. Try these 6 steps. Are you bored, wanting to be free of a boss, or eager to jump on the bandwagon of a hot technology? These are not valid reasons to start a business. But if you’re focused on solving a customer problem, believe you can do better than anyone else, and are dying to work long hours, wear many hats, and balance responsibilities, you have the right start-up mindset. If you equate business ownership with solitude and freedom from annoying coworkers or managers, you’re in for a surprise. Entrepreneurs spend most of their time dealing with people — investors, professionals such as lawyers and accountants, suppliers, and customers. Ever managed employees and vendors? Do you know your industry inside and out, including aspects such as accounting and marketing? If you don’t have all the entrepreneurial skills you need, acquire them before starting your business. Spend time working in a similar company, shadow a business in your industry, or accept an internship. Be honest about your relationship with money. Do you have money to invest? Are you able to lose it all? Will you rely on others? Do you avoid financial risk at all costs? Are you “good” with money? How you handle money now will influence the type of financial manager you’ll be. Is your market saturated with successful businesses? Is your industry littered with bad businesses? Is anyone doing what you want to do? If not, why not? To brand your business and woo investors, you’ll need to understand why and how you can outshine competitors. Carol Roth has been helping businesses grow for over 15 years, ranging from solopreneurs to multinational corporations. She has helped them raise more than $1 billion in capital, complete hundreds of millions of dollars in M&A transactions, secure high-profile licensing and partnership deals, create brand loyalty programs, and more. A popular media personality on Fox News, MSNBC, and WGN-TV Chicago, among others, she has an award-winning blog at www.CarolRoth.com. 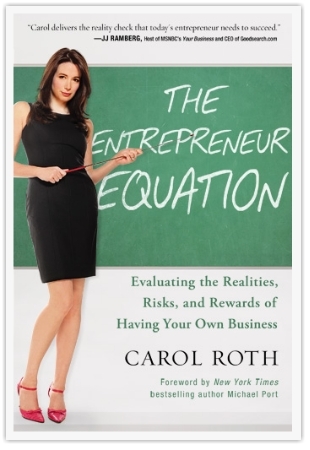 Her new book is The Entrepreneur Equation: Evaluating the Realities, Risks, and Rewards of Having Your Own Business (BenBella Books, March 2011). Another supplement to running a successful business is receiving a business intelligence certification from an online university. This will help provide you with skills to integrate the worlds of business and technology.